Customizing your Fileboard account with your Domain. You can set your file links and live meeting links to reflect your own custom domain. Setup a subdomain, also called a CNAME, with the hosting service for your domain. You can also contact your hosting provider and ask them for the most current information on how to setup a subdomain through them. In most cases, they will guide you through the process specific to their instructions. Once the subdomain is setup, you can return to your Fileboard account and enter the information. 2. 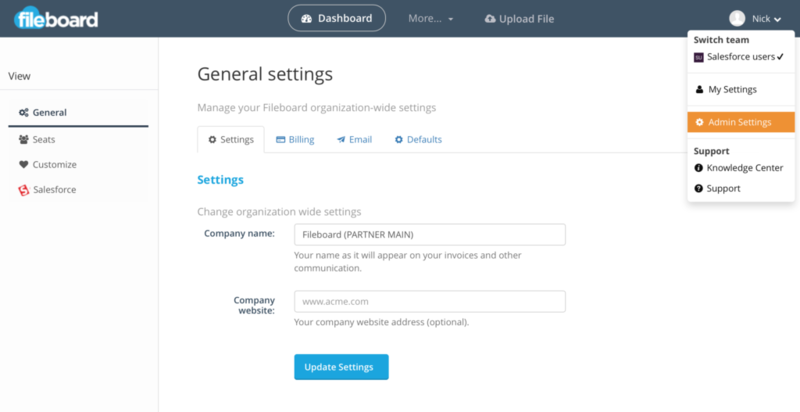 Select Admin in the bottom right hand corner of your Fileboard account. 3. Select Customize under Admin. Here you can enter your custom URL. 4. Select Update Branding. Your new custom domain is now saved into Fileboard and will work as soon as the hosting provider you use has updated your account settings.